Do you remember the Nintendo Cereal System from 1988? 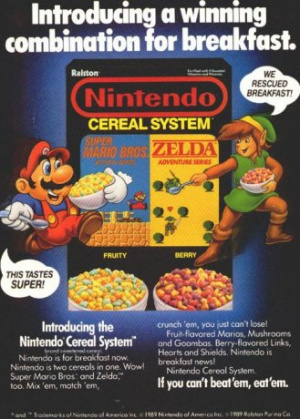 It let people who just couldn't get enough of Mario and Zelda to pour them into a bowl and eat them, keeping their spirits (but, sadly, not powers) with you all throughout the day by way of two different types of cereal: fruit-flavored for Mario, berry for Zelda. It came with some neat collectible cards, and you could even get a PowerPad or a sweet Mario cereal bowl through offers on the box. In yet another example of video game collector's having no limits, an unopened box of the NCS was bid on 22 times and eventually sold on eBay for $207.50 USD. To whoever bought it: please don't eat this cereal. If you do, please post a video online for the world to watch in morbid fascination, or at the very least live-tweet your taste bud sensations. And try sending in for that Mario cereal bowl. I always forget that in the 80's you had to have the prerequisite Saturday morning cartoon and breakfast cereal in order to be the "in" thing. I think if somebody actually ate that now, we wouldn't see them for a long while lol. WOW this is awesome. Looks so cool. As for the commercial, that's one of the most annoying songs ever. "Nin-ten-do. It's for breakfast now!" Two cereals in one, WOW!! Haha the Mario in the cereal is just an unrecognizable orange character. And Zelda a pink/purpe one. "If you can't beat'em, eat'em!" They should have done a Kirby version. Buyer, open it and post the pictures! Argh!!! I actually had a few boxes back in the day. I know of this but I don't remember actually eating any. Pokémon cereal, though, I remember eating that. It was a Cheerios ripoff with Pokémon-shaped marshmallows, similar to Lucky Charms but nowhere near as good. I'm not sure if they still taste Super, Mario. My palm, buried in my face it is. I'm also curious as to the state of the inner contents. Me, I know that this obviously had collector's value, and I do not mean to belittle this event, but I would much rather make my own Nintendo-based eats (especially since I do not trust breakfast cereal anymore). I would actually eat it, it looks yummy! I remember eating it as a kid a couple of times, they weren't as good as Crunch Berries. I've seen this advert before, it's hilarious. Link looks like a teddy bear. So dated, the outfits and the special effects. I love the cheesy American voice "There's Zel-Duh Too!". I remember in the UK a Pokemon cereal, about 9(!) years ago, around the same time Ant & Dec rapped about it on Saturday mornings. I thought it tasted rank, but tried to convince myself anyway because "It's Pokemon!" Wow, a Nintendo Cereal System (NCS)? Sounds awesome. Never heard of it prior to today (I wasn't born until 1991). I remember the cereal. I also remember it tasting terrible and never buying another box. I bet it's chalk full of preservatives and artificial flavors. It should be safe to eat for another 25 years at least. Anyone else want that game now? My cousins and I ate about 20 boxes of these during there limited run in the late eighties. Fabulous. Seriously, my mind is blown by how much awesomeness is in that commercial. I remember this cereal. 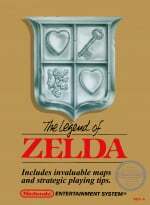 The Legend of Zelda berry flavor tasted like Berry Berry Kix. Wait a sec, the slogan on the ad is "If you cant beat 'em, eat 'em." Possible foreshadowing to a beloved Nintendo Franchise? I wonder if there is still a market for a Nintendo cereal nowadays, what with gamings supposed popularity- can you imagine the little gifts! Let's dream up some potential names! I remember that cereal. It actually tasted pretty good. Ahh, the memories. Well, that's certainly gross. 22 year old cereal. Hurrah for 80's advertising. I'm glad Nintendo's adverts have improved since th-- oh. LOL, best advertising line ever. Ten bucks that the guy's mom or someone is going to find that box and pour it for breakfast the morning after. Don't eat it EVER!That cereal"s really old! why did'nt my smiley turn into a picture smiley?